So I am in the house with a major craving for chocolate like BIG time! So I had some grapes. NOTHING. 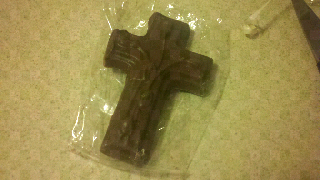 Then I remembered that we got some chocolate favors from a christening we went two about two weeks ago. I stuffed them in the fridge in the back section so I didn't eat them all at once. JACKPOT! Remembered about them today! Woop Woop. Love the blog! :) Thanks for following, you are so sweet!